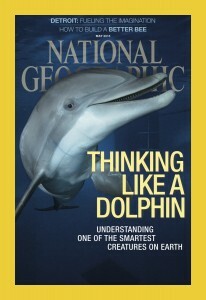 WDP has been featured in magazines such as Outside Magazine and National Geographic. If you have any questions about downloading any of these links, feel free to contact us at info@wilddolphinproject.org. "Dr. Denise Herzing: Dolphin Whisperer"
"It’s Time For A Conversation"
"Dolphin Speak: Understanding Wild Atlantic Spotted Dolphins"
"At Home with the Wild Dolphins"
In this issue, Dr. Norris and Flip travel around the world visiting sites where dolphins live and where they are challenged by environment and human impacts. See Dr. Herzing’s research described in this issue. On the cover are Nippy and Nassau, mother and calf. Nassau is still around and is a mother herself…see Brian Skerry’s blog where he photographed Nassau and her calf Nautilus in 2013 with the Wild Dolphin Project. "Understanding the Behavioral Biology of Dolphins"
"Underwater and Close Up with Spotted Dolphins"